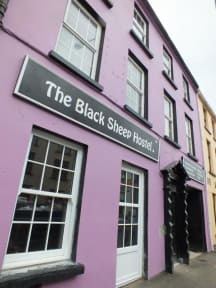 This is the best hostel that I have stayed in Ireland, with the best people and atmosphere. Also they have a very conscious mind of our environment that’s make you feel very comfortable. El mejor hostel en que estuve en Irlanda, todo limpio, buen ambiente, las cama cómodas con enchufes,luz y cortinas. 100% recomendable. Excelente estadía. Nos encantó Killarney y el hostel mejoró nuestra estadía. Cada cama cuenta con su privacidad al tener cortinas, enchufes y luz individual. Los colchones son muy cómodos. El personal es súper agradable y todo el ambiente es muy respetuoso y amable. There aren't enough good things to say about this Hostel. I met more people there than in any other. The atmosphere is beautiful, the house is amazing, the pod beds are the best that can happen to any traveller. There's a patio with dogs!!! What else can one ask? I was going to spend just 2 nights there and decided to extend my stay bc of the good vive. it's at walking distance of the center with all the restaurants and pubs and near the National Park. Just wonderful! I will definitely repeat. Excelente! El staff muy amable. Los espacios muy cómodos. La cama súper cómoda! Volvería sin pensarlo! Very friendly hostel. No complaints at all. There's nothing I could say should be topped Up. The hostel IS beyond amazing. Surely coming back! The hostel is comfortable, tidy, clean and looks awesome. The room was great, big bed with your own courtain and light so you can have privacy and not disturb other guests. Bathroom in the room (I was in a six female dorm) The kitchen is perfect. The hostel is next to the national park and just a few minutes walk from the Maine st. The staff was helpful and kind, specially Eleonora and the owner, Kevin, cooks a delicious irish stew :) Would certainly stay there again if I went back to Killarney.